The Good, The Bad and Drug Shortages. It doesn’t take a rocket scientist to know that when you don’t have enough of a good thing, bad things can happen. This is the case with the on-going drug shortages and the resulting potential issues that affect the care we provide and patient safety concerns. The ISMP (Institute for Safe Medication Practices) recently released the results of a national survey of more than 1,800 healthcare practitioners regarding drug shortages. Many stated a high level of frustration and that the drug shortage problem has risen to the level of a national public health crisis. According to ISMP, survey participants were alarmed by the ever-increasing volume of critically important medications in short supply (FDA Drug shortage list) and the resulting use of less desirable, unfamiliar alternative drugs where available. They felt that shortages have significantly increased the potential for errors and patient harm caused by absent or delayed treatment or preventable adverse drug events associated with alternative drugs or dosage forms. Do you take the time to check a drug reference when alternative products, if available are substituted? Often, these products appear in our medication cabinets and we have never seen or given that drug before. Do you take the time to double check the dosage, concentration, and preparation of an alternate product? Just because the drugs belong in the same category, the recommendation may not be the same as the original drug. Do you take extra precautions to monitor and assess patients when an alternative product is administered? Particularly when the patient received an original medication that now is on the drug shortage list. Do you know what your organization’s plan of action is regarding drug shortages? Is there even a plan? What if your pharmacy isn’t 24/7? Would you know what to do? 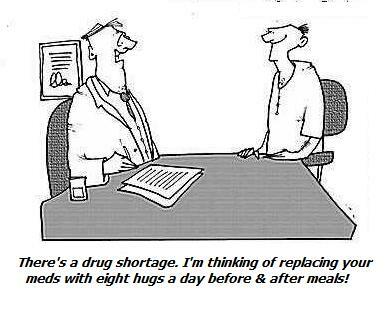 Love your pharmacists – the drug shortage is not their fault and they are working diligently to get what we need. Be assured that several professional and national organizations are trying to get a handle on this issue, no solution yet so we still need to be prepared. The Good…well, there’s nothing really good about drug shortages, unless according to USA Today… you’re a prisoner with an execution order!